The road was basically like this the whole day. The road from Chigorodó was totally flat, plus, we had a tailwind, so we really had no excuse to be going so slowly except that it was our first day back to touring on loaded bikes. We did decide to stop and visit a banana plantation, which set us back a few hours. Uraba is dense with banana and plantain trees, and for a good portion of our ride, we had been passing these plantations. After passing so many, Lenin stopped to talk to some kids on the side of the road, and they agreed to show us one of the plantations. We walked with them across the street and started down a long dirt road surrounded by rows of banana trees. One of the boys tries to help by pushing my bike through the mud. This walk definitely brought our average pace down, but it was worth it. After walking for maybe a mile, we turned off the road and onto a narrow trail between more rows of trees. We even had to cross a few streams, carefully balancing with our bikes over skinny planks of cement. Running along the row of trees was an overhead track, that was part of a network of tracks connecting all of the rows and aisles throughout the plantation. We finally arrived at the processing plant, where a huge conveyor belt was rising up and dropping bunches of green bananas onto a mountain of more bananas. Apparently, these were the rejects that were not fit for exportation but would be sold to Colombians. We observed the entire process of banana processing, from the branches that get pulled along the tracks to the last conveyor belt that carries the boxes of cleaned, cut and stickered banana bunches into the trucks that would haul them away for exportation. The factory workers even let us try pulling the stalks that arrived in waves from somewhere within the plantation. The tracks all converged back at the factory, and bananas could be coming from as far as 2 or 3 kilometers. From there, they were cut into manageable bunches of 5 or 6 bananas and dropped into an enormous vat of water to be cleaned. They floated across the water vat to the workers who would support out which ones were good enough and which were the rejects for the concept belt I had seen when we first arrived. The good ones get dropped into another water bath, floating over to more workers who put stickers on them and add them to plastic bins on another conveyor belt. Each bin pauses for a few seconds while the conveyor belt takes them under a glass box where they get misted with a mineral that prevents them from ripening too quickly. Then the conveyor belt continues and the bananas get transferred from plastic bins to cardboard boxes, which get loaded into the waiting trucks. The bananas we watched were bound for Europe. Before leaving, we gave some money to the boys who had led us to the factory. Back on the road, we didn’t get very far before it started raining, and we ducked under the cover of a furniture maker that happened to be along the side of the road at the time. They were making bed frames, tables and chairs out of teak, which is another common crop of the region. We had only completed 38 miles before stopping in Turbo, a port that is projected to grow to be one of the country’s largest, due to its proximity to Medellín. Shortly after arriving in town, a friend of Lenin’s from Uramita pulled up on the back of a motorcycle and greeted him. We followed Tata to her grocery store, where she led us into a small, air conditioned office and had one of her employees bring us fresh juice. Shortly after, Tata drove us to a restaurant near the port so we could share lunch. Fish is plentiful and cheap in this region, and we would eat it nearly every day while touring along the coast. Back at the grocery store, Tata invited us to stay the night at her house, so we loaded our bikes into her pickup truck and rode with her in the direction from where we came, backtracking several kilometers. On the way to her house, Tata pulled in front of a butcher shop and started ordering meat, calling out over the blaring music to the butcher from her window. After several exchanges of meats and money, we were off to her house. Tata lives in a nice house outside of Turbo with her three kids, her sister, and two women hired to clean and cook. Her husband has been in prison for the past two years, and Tata was preparing to visit him the following morning. I helped her and her sister pack basic dry goods like oats, coffee, sugar, and crackers into clear plastic bags to bring to the prison. Tata goes to visit every week, but this week she had another family member joining her, so she could bring an extra portion of all of the food she usually brings for her husband. The extra bags would be for her husband’s cell mate so he doesn’t have to share half of his food. While their family doesn’t live too far away distance-wise, their family rarely ever goes out of their way to visit them in Turbo, so sadly, Tata is normally her husband’s sole visitor. We came back to Medellín on Christmas Eve, a day that people celebrate by getting pigs drunk and then chasing them around the neighborhood before slaughtering them to roast outside. We arrived too late to participate in this ceremony, but the music, drinking and dancing went on all night. We walked around Lenin’s neighborhood for a while, visiting his friends and family. ​The next day, while walking to the market to get vegetables, I noticed a dog staring out the window of a veterinarian shop. On the way back from the market, I pointed him out to Lenin. We went inside to say hi, and four or five other dogs came to greet us. The one puppy who was most friendly with me was a mutt that they had rescued from the street, and the man told us he was free for adoption. We stayed and played with all the dogs for a long time, but in the end, I couldn’t leave without this puppy. The man in the shop gave us a leash, harness, two toys and a bag of dog food, and we left with our new dog. Churro is much faster than me at hiking, and this is only his first hike! ​We named him Churro, and we immediately fell in love with him. He was quiet, smart, easy going and affectionate. He was only about 5 months old and had innocent eyes and big ears. Churro was very motivated by food and easy to train. Within the first week, we had taught him to sit, give his paw, roll over and jump. Not only was Churro a fast learner, but he was athletic as well. 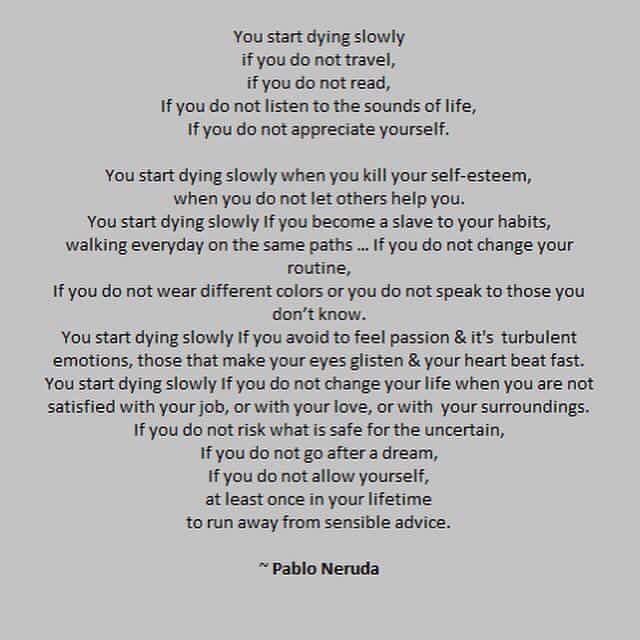 He loved to run, and he was fast. We took him up to Tres Cruces and down again in record time. 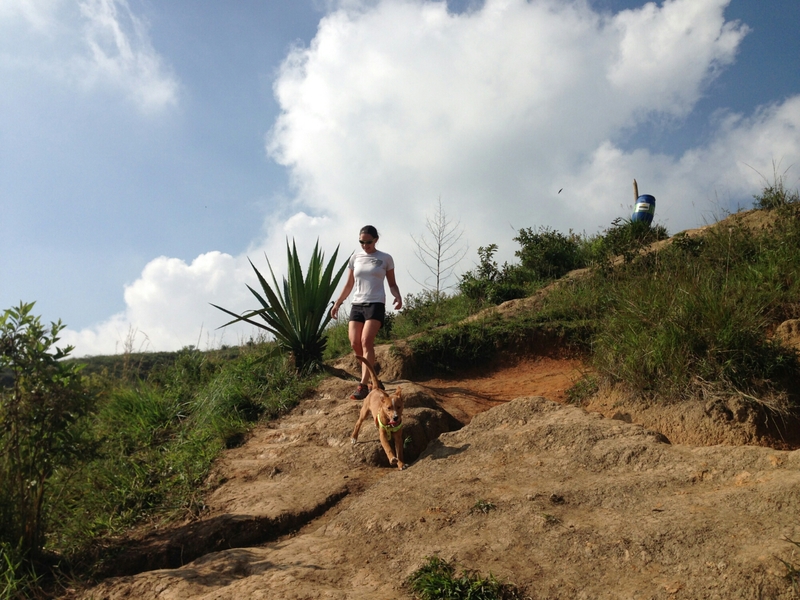 Our grandest adventure was a hike from La Sierra in Medellín up to Pan de Azucar and on to Parque Arví, where Churro discovered swimming for the first time. Every new experience for this puppy was a joy to watch. After a week of taking Churro on adventures within and around Medellín, we were itching to get back on our bikes and explore more of Colombia with him. Lenin’s brother, Edwin, had a bike trailer that he had bought in the US to take his daughter biking, but he never used it. It took a few asks, but eventually he agreed to sell it to us. 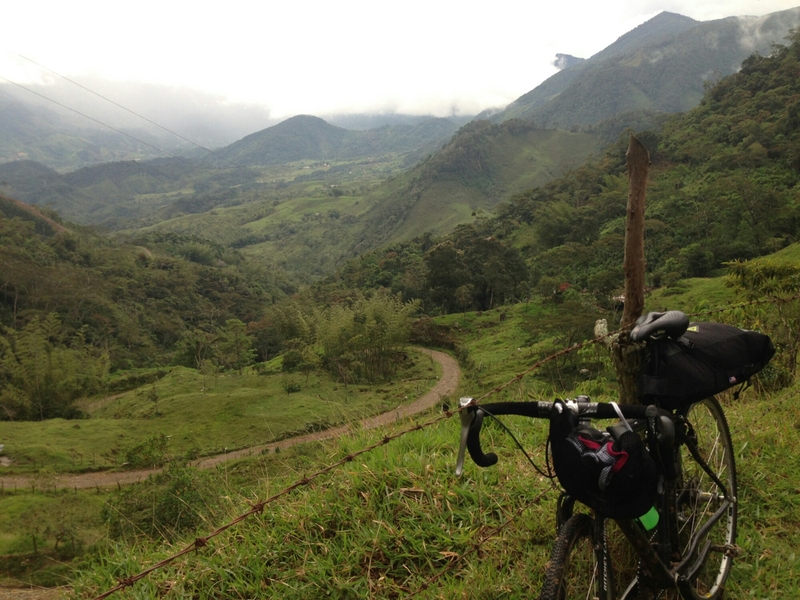 The day after New Year’s Day, we set off on an indefinite journey to ride our bikes with Churro around Colombia. Lenin woke me up abruptly with an urgent request that we pack up everything and be ready to get on a bus in 30 minutes. The bus would drive by the road that was a 10 minute walk from the house, and we could get down to town that way instead of trying to ride our bikes down the horrible rocky road. Our bikes were another 10 minute walk or so down the mountain at someone else’s house, where we left them the night we arrived. All of our stuff was everywhere, including hidden away in the wardrobe by Luis’s wife, who had cleaned the house while we were away the day before. I didn’t want to argue, so I just started packing and got ready. I looked at my phone, and it was just past 7am. This is before the chiva got a little crowded! ​The two kids helped us carry our bags to the road, where several other people were standing at an abandoned house, waiting for the bus. Luis had left earlier to get our bikes and load them on the bus before it reached us. We waited for about an hour before anything showed up. It wasn’t just a bus, but a chiva – a traditional mode of transportation that comes by only on Saturday and Sunday mornings to take the farmers into town. We piled our stuff and ourselves onto the top, along with the other people and their various belongings. On top of the chiva was a bench in the front, already full of people. The rest of the roof was flat with rails along the edge so the variety of things on top wouldn’t slide off. 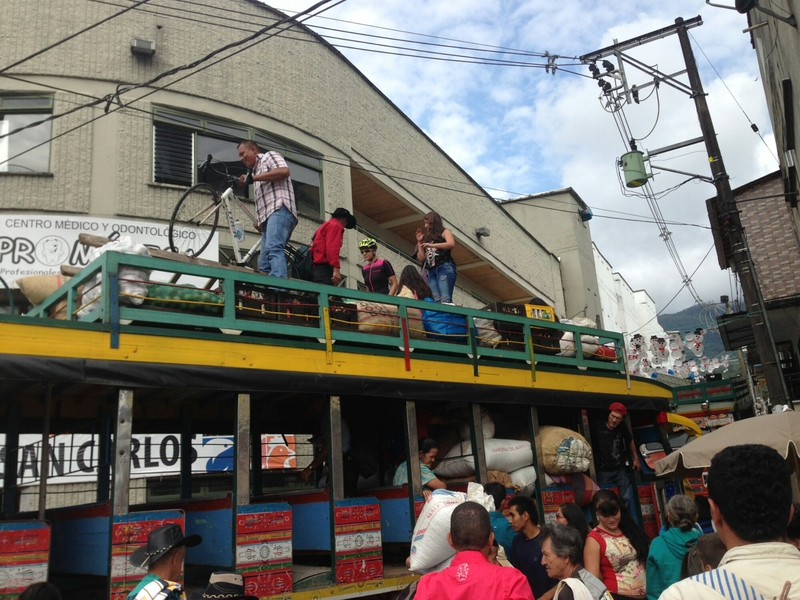 These things included huge burlap sacks of maybe beans or coffee, crates of empty beer bottles, empty gas/propane cylinders, bunches of plantains, a ladder, a weed whacker, our two bicycles, and a few other people who were brave enough to sit on top of the whole thing. I took a seat near the front on a sack of beans or something, and lenin sat on one of the gas cylinders. ​From where I sat on the left side, so high up, I felt like I could easily fall out and over the cliff into the steep valley below. 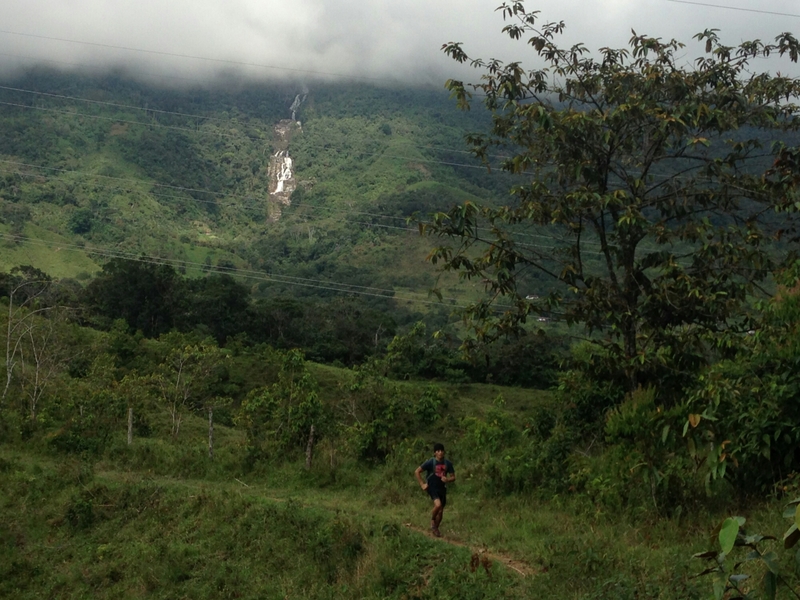 The road was too narrow to see on the sides of the chiva below us, and I felt it sway from side to side as it struggled over the rocky terrain. We continued up and over the mountain to pick up more people before heading down into town. At one point the chiva couldn’t make it around a tight turn on the steep climb, and it had to back up several times to get it right. This was the most terrifying part, and I had to have a lot of faith in the driver and whoever was guiding him, as all I could see was my side of the chiva getting closer and closer to the edge of the cliff each time it backed up to try again. I breathed a sigh of relief when we finally made it around the curve, but we still had a long way to go and had to stay alert to duck under the tree branches and cables. One benefit of being so high up and close to the trees, aside from the terrific view, was that we were able to pluck fruit from the branches as we passed underneath. Along the road were mandarin, orange, lemon, guava, avocado and guama trees. I had never tried guama before – a large pod containing black seeds surrounded by an edible, sweet white flesh. I also never realized that all guavas are full of parasitic worms, and people eat them like that without even thinking about it! Maybe that’s why they only sell the juice in the US. The only thing this chiva was missing was the music. Lenin told me that chiva rides can be very long, and normally the passengers, mostly farmers, will take their instruments and play music, drink beer, and party during the ride. When Lenin was a boy in Uramita, people would sometimes take a chiva to Medellin, a 10-hour or more drive on unpaved roads. Sometimes there would be a landslide on the road, and they would be delayed for a few days, so everyone brought tons of food to cook along the way. Nowadays in Colombia’s more touristy cities, chivas are purely used for entertainment. They can be rented out for parties, and people just drink and dance inside while the bus slowly rolls through the city. ​When we finally rolled into town, we still had to fix a flat tire before heading out of San Carlos. We only made it a few miles outside of San Carlos before Lenin got another flat tire! At least this road was mostly paved. The flat happened when the paved section turned into dirt for a few feet. My exhaustion was catching up with me, and after 30 miles or so of rolling hills, I wasn’t really feeling like pushing myself that hard. We stopped for a few coconut popsicles at a roadside shop, and when Lenin got another flat tire about a mile down from there, we decided to wait for a bus. While waiting, we saw some wild titi monkeys cross the road just a few meters ahead of us before climbing high into the trees. Instead of hopping on a bus, we were able to hitch a ride from a guy driving a small, empty truck. We loaded into the back and enjoyed the free ride into San Rafael. From there, we had about an hour to wait for a bus back to Medellin so we could come back for Christmas Eve. 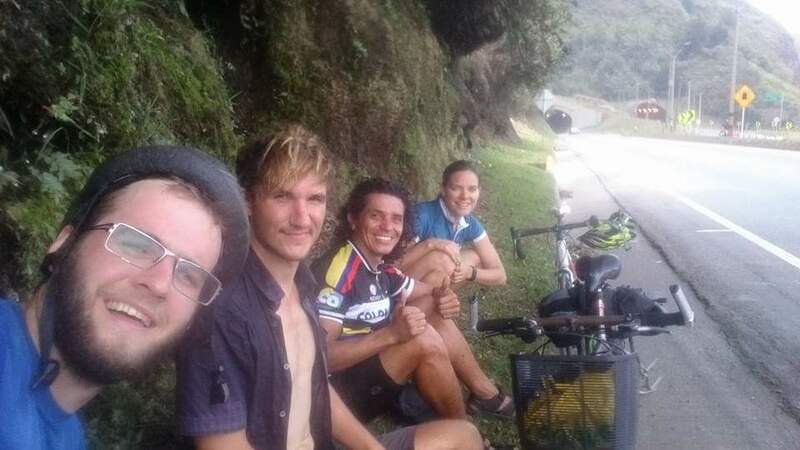 Originally, we were going to bike back to Guatape after one night in Puerto Rico, but it was so beautiful and so difficult to get to that we decided to stay another day. We rose early to run to San Carlos, about five miles away. Before leaving, Lenin got instructions from Luis, the father of the family caring for Paola’s house, for how to get there via trails instead of taking the steep and rocky road that we had driven up the previous night. We started off on muddy trails through cow pastures, following the heavy footsteps of the cows. Sadly, much of the land has been stripped of its natural vegetation and replaced with grass, lowering the tolerance of the land for rainwater. The saturated land doesn’t have enough trees or other plants to soak up the water, so it ends of being muddy and slippery, also creating landslide hazards. Fortunately, we soon entered a more untouched section of jungle where the trails were dryer, and we gained more traction. We came across someone’s house here in the middle of the mountains, surrounded by pineapples growing on the hillside. ​According to Luis’s directions, we were to cross under the powerlines and bear right on the trails when we came to a big tree. Then we would come to a house with an old lady and about 20 dogs. I’m not sure what we were supposed to do when we got there, but we did eventually come to this house with numerous dogs. At that point, we encountered two people on horseback who were also going to San Carlos. They led us back on the right track, and we chased the horses as fast as we could until they got too far ahead. This trail led us to a river where we crossed an old, narrow bridge that was suspended over the river. From there, we had to ask a farmer for directions again, since we somehow ended up in his backyard. The trail finally emerged into the outskirts of San Carlos, and we walked into the center of town for lunch. ​After lunch, we decided to climb up to la Piedra del Tabor – another giant stone like the one in Guatape, but with no stairs and even higher of a climb. As we walked back out of town, we passed a dog who was lying in the sun. He got up, and we invited him to follow us. 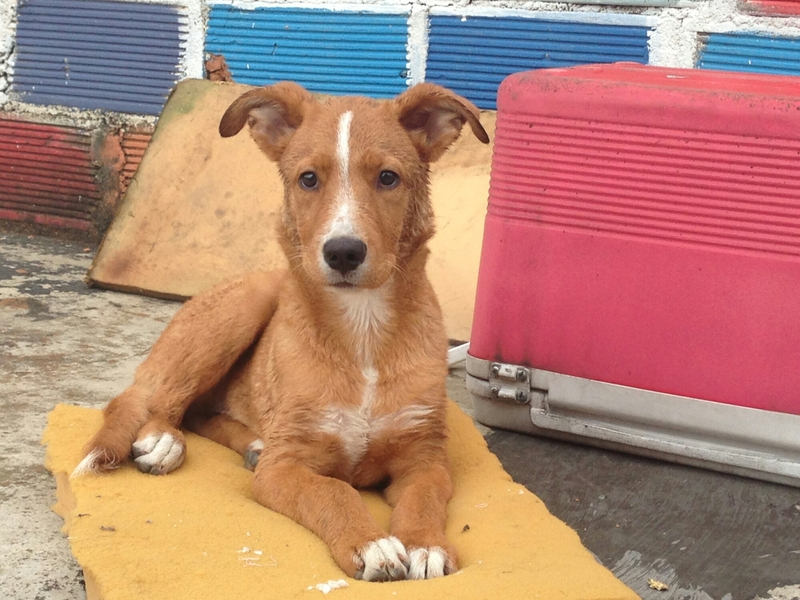 There are hundreds of stray dogs in every town, and it’s so hard to ignore them. This one was very friendly, cleaner-looking than most, and looked to be about 2 years old. He was maybe a cross between a yellow lab and pit bull. Lenin asked several people in town how to get to the stone, and once we were on the road out of town, he asked one more farmer about which trail to take. At this last junction, before traversing the farm and entering the narrow, steep trail, Lenin comments, “funny, they all say the same thing, to be careful of the tigers”. You can imagine how I felt for the rest of the hike up to the stone. ​At one point, we stopped to bathe in a waterfall and refill our water bottles with fresh spring water. When we finally reached the stone, it was already growing dark on the shaded trail. The toughest part of the climb began near the base of the stone, and we continued up the even steeper, more slippery trail. We emerged from the woods and had yet more rocks to climb. The dog almost couldn’t make it up one of these rocky sections, and he stood whimpering until we encouraged him enough to jump for it. Just past this point, Lenin saw a poisonous snake. We couldn’t go much higher than this because the rock was too slippery and there was no easy way to climb, as it was nearly vertical. It was still sunny up on the rock, but we needed to move quickly to get out of the woods before it became impossible to see. For the entire hike back down, I was scared of both tigers and snakes while I tried not to slip on the muddy trail. Going down is always harder for me than climbing up, but I think I went faster than usual this time. We really loved this dog, and we considered adopting him. ​Once we were in the clear again, we shared our leftover lunch with the dog. Back in town, he got distracted and wandered away to say hi to some other people, and we never saw him again. 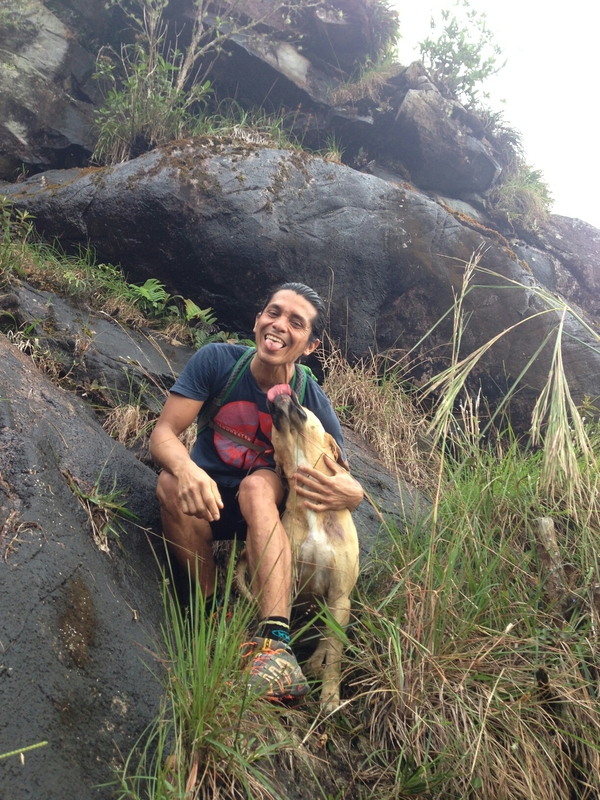 That night we agreed that if we saw the dog the next morning we would take him with us to Medellin. To get back to the house in Puerto Rico, a moto-taxi cost a minimum of $30,000 pesos ($10). We debated staying in a hotel in town that night instead, since it was cheaper than getting a ride back, but then Lenin found a guy on a motorcycle who was willing to take us there for only $20,000 pesos. We needed two motorcycles though, so he had to find someone else willing to go for $10,000. He came back a few minutes later with another guy on a motorcycle, and we each got on the back of one. The ride was insanely bumpy, but I felt much better on the motorcycle than I had the night before in the pick-up truck. The things people do in this country on a daily basis is astounding, and commutes like these are probably most bewildering to me. For example, Lenin and I met some farmers selling honey in San Rafael who walk 2 hours each way every day from their bee farms to sell their honey. They don’t just walk on flat roads – they walk over mountains on gnarly trails that are sometimes washed out by landslides or covered in deep mud. The people we met on horses while trail running earlier were probably just going on a routine trip into the town for groceries or something. The next day we would experience yet another mode of transportation to get us out of Puerto Rico for the final time. When we went to Guatape, we packed everything, including our bicycles, just in case we didn’t come back to Medellin. When your only plans are to “go with the flow” you never know where you may end up. We ended up staying on Edwin’s house boat in Guatape for three days because I was too sick to go anywhere. When we finally left Guatape, it was to bike to Lenin’s friend Paola’s finca in the mountains just outside of the town of San Carlos. We would bike there via San Rafael and then bike back the next day to catch a ride with Edwin back to Medellin for Christmas. Paola wasn’t able to go to the finca because she was pregnant. I didn’t understand why this was a problem until we got closer. We were traveling very light, and I felt less prepared than I ever have before started a bike tour, but I figured we would be fine. The first 20 miles to San Rafael went by in a flash. The road was smooth, predominantly downhill, and the weather was perfect. We coasted all the way down to San Rafael from Guatape in about an hour. The total distance for the day, according to Google maps, was only just over 30 miles. We were thinking of having lunch in San Rafael, but it was still early, so we just stopped for a snack at a bakery and decided to keep going. Before leaving, someone asked us where we were going. When Lenin answered, “San Carlos”, the man seemed surprised and told us that it was 60 kilometers. That didn’t seem right, so Lenin asked a policeman to confirm the distance. He told us it was 42 km. Double-checking our map, we still saw a way that was only 13 miles. When asking around town about this route, everyone answered that it was impossible to go by bicycle, and that it would take much longer, even though it was half the distance. We decided we were up for the adventure, so continued to follow our map in spite of all the warnings. Almost immediately upon leaving town, the pavement disappeared and the road started to ascend up a mountain. We then encountered two police officers on motorcycles who told us yet again that the road would be impassable on our bikes. We kept going. The next stretch of road was so muddy that our pedals would hit the mud when riding in the ruts left by previous, much heavier vehicles, but we still managed to muscle through the deep mud. Eventually the road grew steeper, and the mud was replaced by loose gravel and jagged stones. When it started to rain, Lenin and I took a break. Lenin had just been explaining to me that we should talk to people we pass because they might invite us in for a coffee and then we can wait out the rain. I didn’t have any expectations of seeing people who would welcome us inside on this lonely road, but sure enough, when it started raining there was a house on the side of the road with a woman who invited us to come under the roof to stay dry. While we were there, she made us coffee from beans that she grew herself. At this point, Lenin decided to put more air in his tires, since he had let some out in between Guatape and San Rafael in fear of the tire exploding with the rising temperatures earlier in the day. Now we were on a rocky road and needed as much air as our tires would permit. Before leaving the woman’s house, he noticed that his tire had gone completely flat. We quickly replaced the tube, as the old one now had a hole near the valve stem, and got back on the road. However, less than a mile up the road, Lenin got another flat. Of course we hadn’t brought a patch kit or tire levers, so Lenin used his toothbrush to pry the tire off the rim. Since we had already used the spare tube, I decided to try tying a knot in the tube around the hole, since I had seen my friend Amanda do this once while mountain biking with some success. It actually worked quite well, until Lenin got yet another flat tire while testing it out. Then it started raining again. Since we couldn’t tie another knot in the tube, we resorted to using the extra tube for my bike, which was about a centimeter wider. This lasted only another mile or so before he flatted again. This time the air was leaking out slowly enough that Lenin could pump it up and ride a few hundred yards on it before having to stop and pump it up again. He quickly tired of this though, as the tire began losing air more rapidly with each repitition. We had just made it to the high point of the road, but we still had about 5 miles to descend on that road before going up again to where Paola’s finca was. The sun was just about to set, and we had barely gone 7 miles from San Raphael. We started walking down the mountain as it grew darker by the minute. To make matters worse, the seatpost bag I was using to carry half of my stuff broke, and I had to carry it on my shoulder. We walked on until it was pitch black before turning on our headlights, which only illuminated the thick fog and the occasional frog hopping across our path. ​At the bottom of the road, we came to the junction of Vallejuelo, where two people were sitting outside of a house. One of these people had a truck, and he offered to drive us the rest of the way to Paola’s finca. Paola had also phoned someone to help us get there, but he only had a moto. This guy showed up to the house where we were and joined to show us the way. We piled all of our belongings into the back of the pickup truck and climbed in for the ride. I was astounded by the condition of the road, and I felt guilty for the guy who was taking his truck over such damaging terrain on our behalf, but he didn’t seem to mind. The rocks were huge, potholes even bigger, and we were going up a pretty steep hill the entire way. In the darkness, it felt more gnarly than my rockiest mountain bike ride. We stopped at a small tienda where we could keep our bikes safe on the way up, and then continued on up until we got to a fence. Paola’s friend got out and opened the gate for us, and the truck turned to drive through a muddy field to another gate. Beyond this gate was the house. I was skeptical that the truck would make it back up and out of the mud, but we didn’t stick around to watch them leave. Our third day back in Medellin, Lenin woke me up before sunrise. The previous morning, we met up with Lenin’s brother, Edwin, to run up to Los Tres Cruces, a climb so steep that none of us could actually run up it. As much as I hate waking up early, we agreed that it was a great way to begin the day. However, I didn’t want to do the same run two days in a row, so Lenin planned a bike ride up to San Felix the next morning. 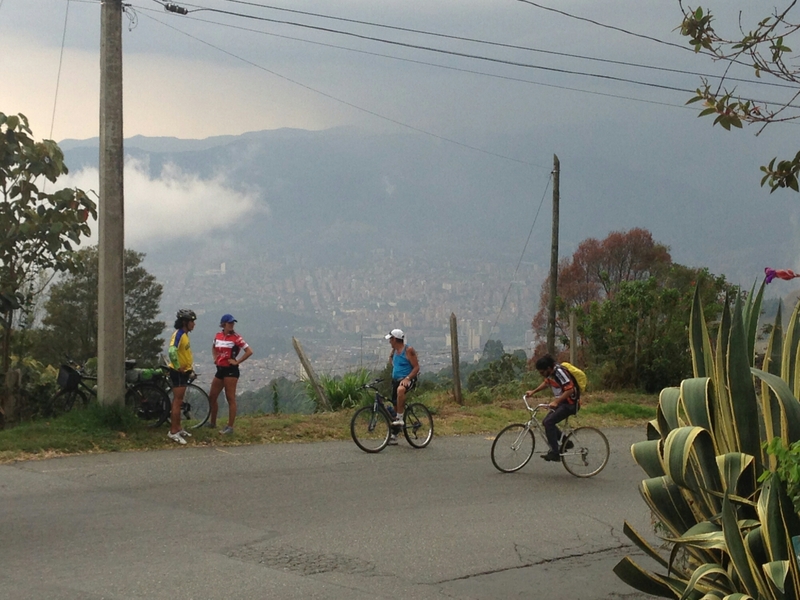 Medellin has plenty of distractions sprinkled throughout the city to keep its people physically active. Aside from the numerous ciclorutas (bike paths), outdoor gyms, skate/bmx parks, soccer fields, basketball courts and swimming pools, there is a huge cycling track by the airport where you can find peletons of people decked out in full spandex, riding laps as fast as they can, as well as people riding hybrids or mountain bikes at a more leisurely pace. Not far from there is a park for roller and inline skating, a running track, and squash courts. You can take ciclorutas from there to El Stadio, where there are even more free sporting activities to do, including another running track and a velodrome. 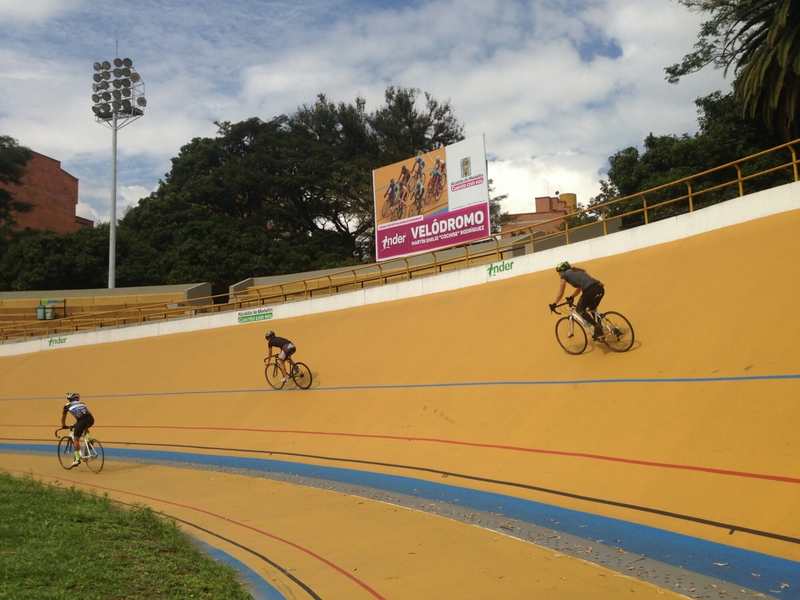 We detoured on our way to San Felix to do some laps around both the cycling track and the velodrome. After properly working up a sweat, we finally headed out of the city and up a mountain (which seems to be the only option when leaving Medellin). Though Lenin had warned me that the ride to San Felix would be uphill for 20 kilometers, I was unprepared for how steep it would be. Neither of our bikes had sufficient gears for climbing, but we powered through regardless. For the first time, I was tempted to grab onto the back of a passing truck as it exuded black clouds of diesel exhaust in my face. I thought better of it though, and somehow managed to pass the truck, which seemed to be struggling more than Lenin and me during the steepest part of the incline. After a short distance the climb became more manageable, and we settled into a steady pace until we reached a place where we could take a break and share some fresas con crema and jugo de guanabano con leche. 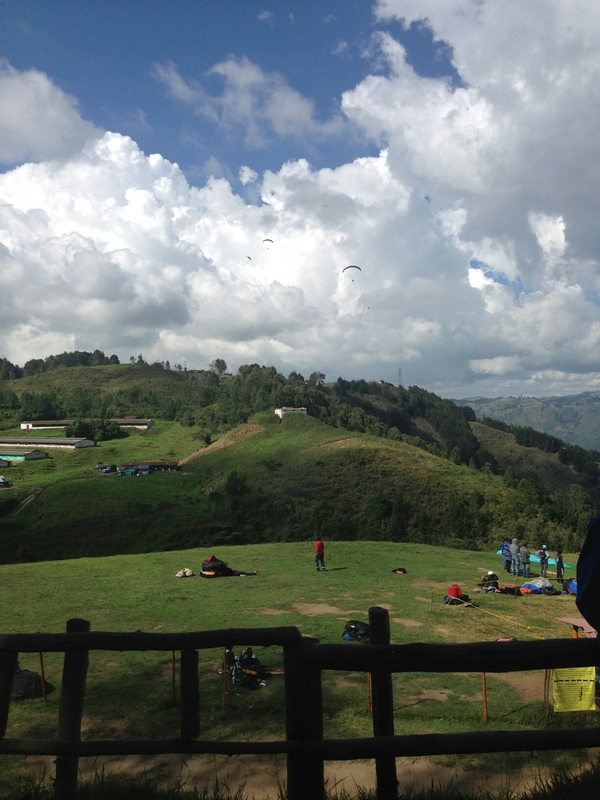 Our destination was another 12 kilometers uphill, where a cluster of paragliding businesses were situated near the top of the mountain, overlooking the city. In his past life as a paraglider, Lenin would come to this place religiously, spending hours every weekend and even sometimes during the week to go flying. Lenin guessed it had been maybe 10 years since he last took flight with a paraglider. He has changed a lot since then, most notably his long hair, and it was apparent when we arrived at the first paragliding business and nobody recognized him. We left our bikes with one shop to walk up a steep set of slippery, uneven steps, to reach the peak of the moutain where most of the paragliders were taking off, landing, or just hanging out. Delving deeper into the paragliding community, memories came trickling back to Lenin. Not a single person recognized him, although he couldn’t remember anybody’s name, so I guess it was fair. He knew their faces though, and when he reintroduced himself to them one by one, seeing the shock and surprised reactions from each of his old paragliding friends never got old. When one of his friends found out that I had never been flying, Lenin asked him to take me on a tandem paraglider. All I had to do was sign something and pay for the insurance. I barely had time to think about it before I was whisked away to the field where people were taking off and landing. Two boys who couldn’t have been older than 13 started strapping me into the paraglider while Lenin tried to explain to me how to take off and land. It all happened so quickly, I don’t think more than 3 minutes had passed from the time I had accepted the offer and suddenly we were running off the side of the mountain. In the air, soaring over the mountains, I felt like my feet might brush the tops of the trees, but then we went higher, far above the point of our take-off. We flew above the forests and farms and had the most spectacular view of the city. I think the ride only lasted 15 minutes, but it was amazing. The bike ride back home took a fraction of the time we spent going up. We coasted all the way down the mountain amid gorgeous scenery and raced through the traffic when we reached the city at the bottom. It was an exciting ride after an adrenaline rush from paragliding. At the end of the day, we met up again with Lenin’s brother to drive to Guatape and spend a few days on his houseboat. During my last week in Medellin before going back to Rhode Island for the summer, I was invited to go for a ride up to Parque Arvi in Santa Elena with Lenin, our friend Anne-Marie and her friend, Juan. The host of the ride was Juan Del Bosque (Juan of the forest), and he was in the process of building a house and campsites on land that he owned within the park. We were to meet at Bici Rolling bike shop at 9am. Four of us left from Lenin’s house shortly before 9am, and we arrived about ten minutes late to the bike shop. Nobody had seen Juan yet, but his bike was still in the shop getting fixed, so we hadn’t missed him. We sat in front of the shop waiting until about 10am, when Juan finally showed up. However, his motorcycle was broken and he needed to drop it off at the moto shop before leaving, so we waiting a bit longer at Bici Rolling for him to do that. While we were waiting, Anne-Marie’s friend, the other Juan, disappeared. Nobody really saw him leave, but Anne-Marie had his bike, so we figured he’d be back. We got hungry before either of the Juans came back, so we decided to go to a nearby market while waiting for some fruit. While we were gone, both Juans had come back and left again at different times. So we waited some more. I think it was about 11 when we finally left, only missing one of the Juans, with plans to meet him along the way. 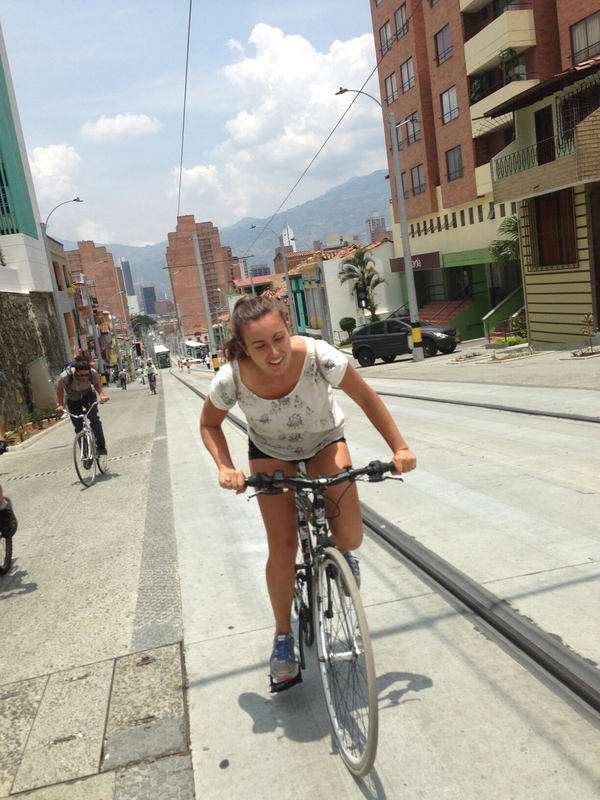 Anne-Marie and Juan del Bosque climb up through Medellin’s Buenos Aires neigborhood. We were finally approaching the edge of the city, on the road that would take us up the mountain to Santa Elena, when I got a flat tire. Of course, it was the one time nobody had remembered to bring any tools or patch kit, so we walked a few blocks uphill to the nearest bike shop where I passed my wheel through a barred window and waited while my tire was repaired. Back on the road again, we only progressed another few blocks up the hill before stopping again, this time to buy fruit from a stand on the side of the road. Looming above the fruit stand, directly overhead, a man on a very rickety ladder was replacing one of the streetlights. There was very little space to move in between the fruit stand and parked cars. Remarkably, working with another man, they managed to lower the old light and raise the new one using a rope without hitting anything or knocking the ladder over. While at the fruit stand, Anne-Marie started talking to an older man who had also been cycling up the same street. He was concerned that she wasn’t wearing enough sun protection and wanted to give her a cycling jersey and hat that he had at his house. After finishing the fruit, we all followed this man to his house, which was on the way up the mountain, and we took turns watching the bikes and going inside where he picked from his ample collection of jerseys to give something to each of us. This man’s name was Jorge, and he lived alone at the age of 65, with a mild case of Parkinson’s disease. Moved by his generosity, Lenin invited him to join us on our ride to Parque Arvi. He had just come back from a ride to the tunnel on the road leading to Santafe, and he was worried about slowing the group down. Lenin and Juan assured him that it was going to be a relaxed ride, which ended up being a bit of an understatement. 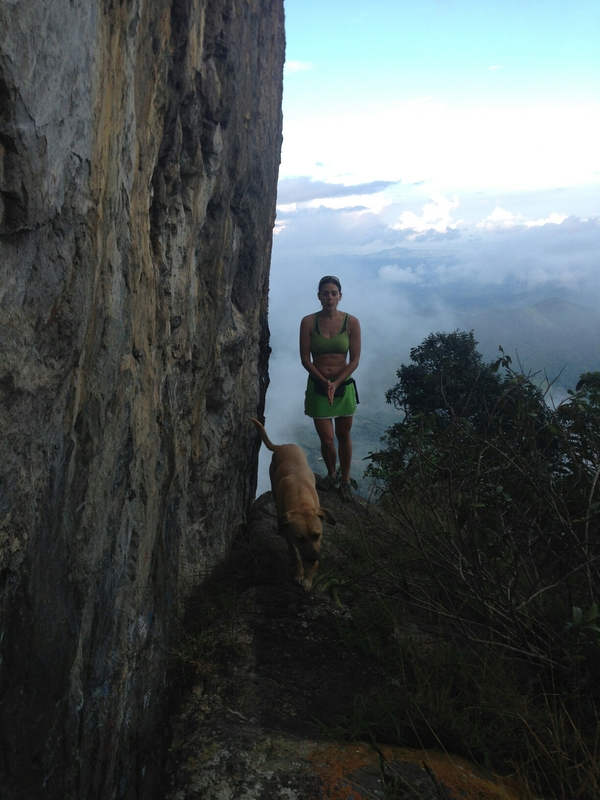 Jorge and Lenin, followed by Anne-Marie, make their way up the mountain and away from the city. The five of us continued up the mountain at a painfully slow pace. Juan del Bosque, who was supposed to be our leader, ended up being the limiting factor for how fast we could go. While his bike was in the shop to get a new chain, what he really needed was a whole new drivetrain. The chain ring and cogs had worn down so much that the new chain fit poorly over the gears, slipping easily if too much pressure was applied to the pedals. 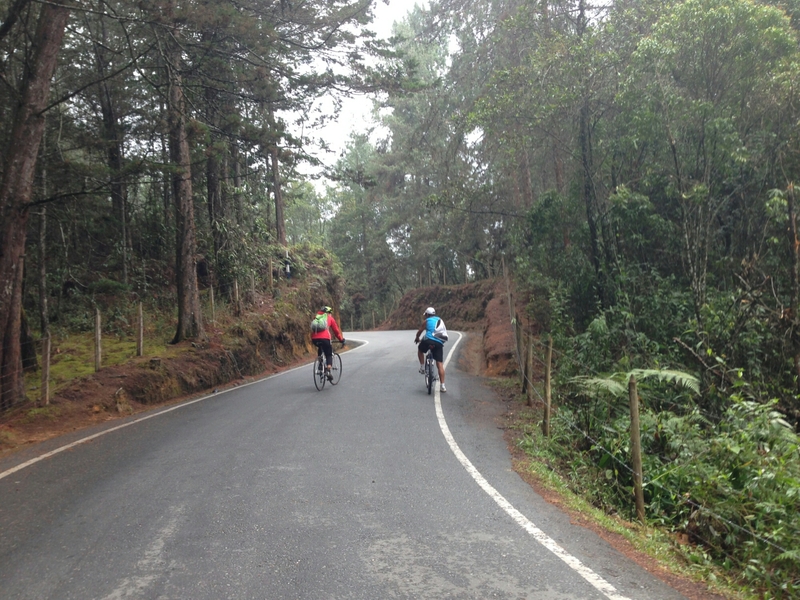 Seeing that the entire ride was uphill, this presented a considerable challenge for Juan. For me, it was a struggle to ride that slowly, so I would ride ahead and then wait for the others to catch up. I tried to let everyone else get ahead a bit so I could pedal by at my own pace for a while, but Jorge would always stop when he reached me and wouldn’t allow me to give him a head start. We couldn’t have gone more than a few kilometers from Jorge’s house before we all stopped again, to buy some food from what looked like somebody’s house. As we sat there eating, I wondered what I had signed myself up for. The day was more than half over, and we were definitely still less than halfway up that mountain. It looked like it was going to rain soon, and I had undoubtedly consumed far more calories than I had burned so far. At this rate, I wasn’t sure if we would make it before dark. I felt anxious to pick up the pace and make it to Juan’s house before it got much later, but it was impossible to get everyone to move faster so I just had to abandon any hope of controlling how the ride was going and resign myself to a very long day of riding (and stopping). There were plenty of reasons to stop along the way. There was a random military checkpoint halfway up, although they didn’t pay us any attention. 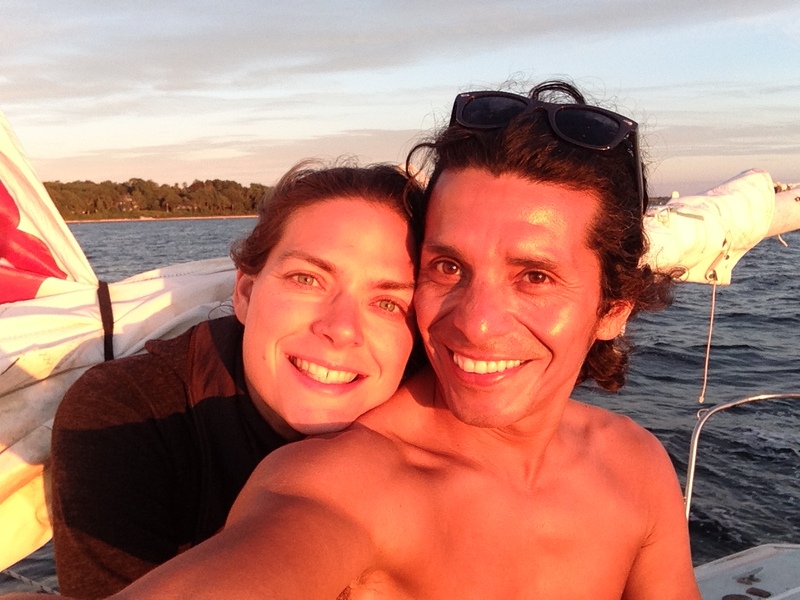 Juan and Anne-Marie switched bicycles at one point because his bike was slowing him down so much. Jorge wanted to rest. Once I had surrendered to inching along at a snail’s pace, I actually started to enjoy the journey and find humor in all the roadblocks along the way. I was even suggesting additional stops, to take photos or to get treats from a bakery. It rained on us more than once, and as we crested the high point on the road and started to coast, the sun dropped behind the distant mountains. We stopped at a grocery store in Santa Elena before going the final distance to Juan’s place to get food for that night and breakfast. 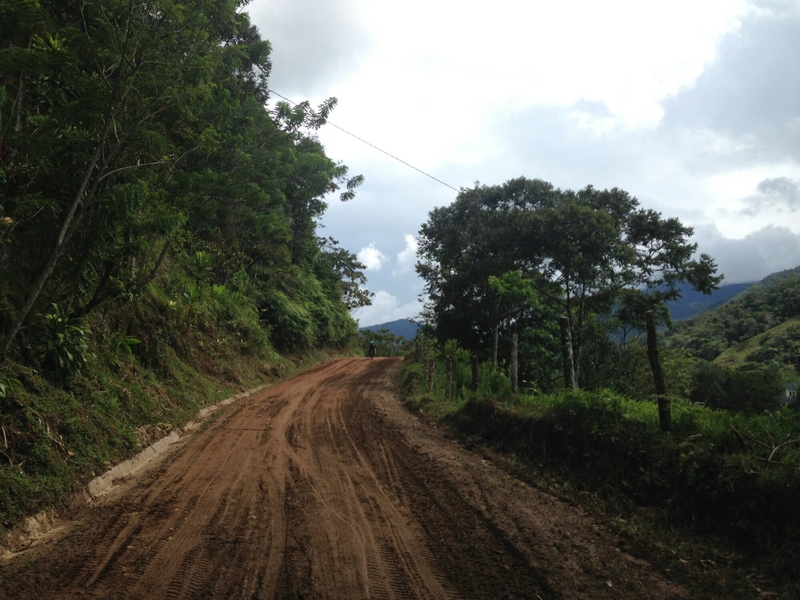 The last stretch of road to Juan’s house was questionable at best, and I feared we would have to turn back. It was soft, wet gravel, narrow and difficult to ride, taking us deep into the forest. Lenin and I arrived first, and waited for what seemed like forever for Juan to catch up and lead us the final few meters to his house. To call it a house is a bit of an overstatement. It was definitely a work in progress. Juan had been building this place from wood and materials that he procured himself or bartered for. He didn’t use money, and he procured all of his food and clothing by working for it, trading, or scavenging. He had a dog who just showed up one day while he was working and never left. The dog ran up to us, barking, when we approached the property. The main structure was like a small two-story cabin with no walls on the first floor. It was more like a bedroom on stilts, with a kitchen area and fireplace underneath. We were all wet from the rain and freezing from the change in altitude, but we made a fire, cooked dinner, and made ourselves comfortable for the night in one of the tents that Juan had on the property. 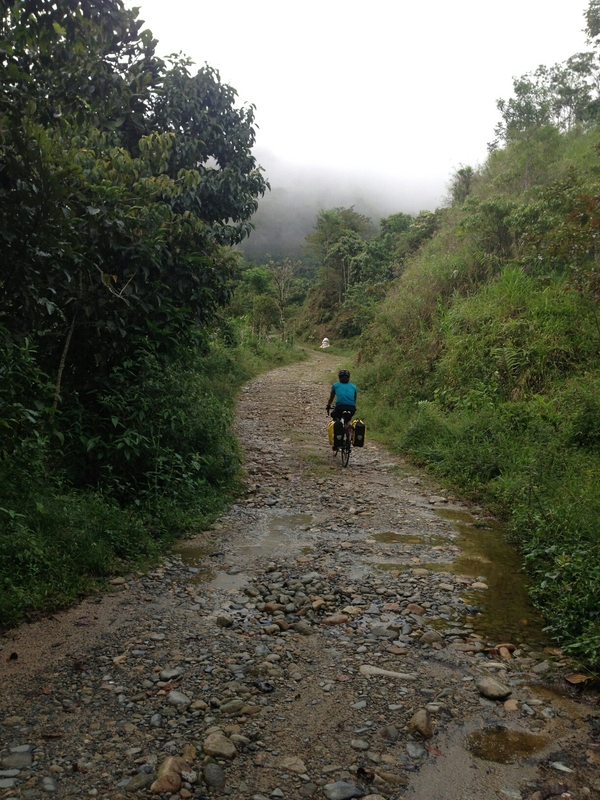 The next morning we got to see Parque Arvi as we biked back down the mountain a different route. The ride down was over much faster than the ride to the top, but I think the long ride up was more memorable. It’s still hard for me to relax when cycling, and I usually want to ride as fast possible for the distance that I plan to ride. However, this experience taught me that it can be okay to slow things down, be patient, and just enjoy my surroundings (and the company) during a ride. 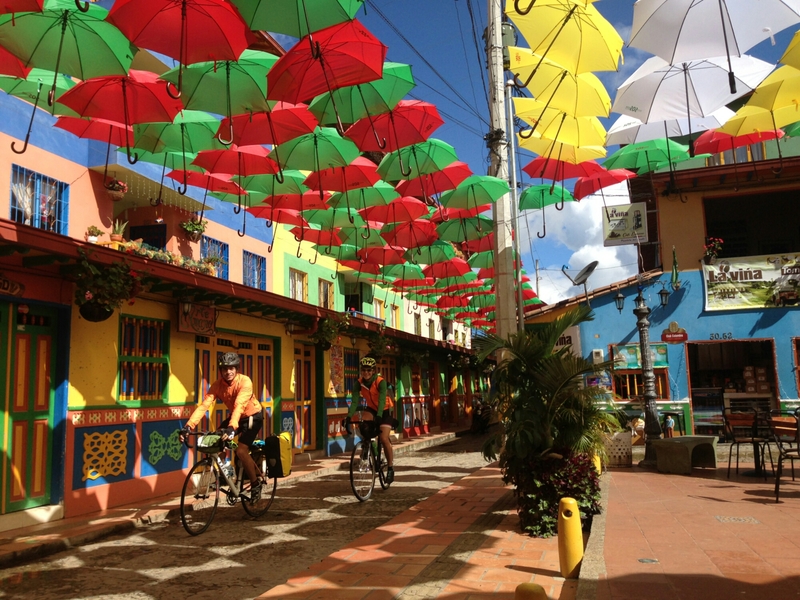 Shortly after Dallas and I parted ways for the last time, I ended up going on the weekly SiCleada bike ride in Medellín. I was incredibly sad and exhausted, and I almost didn’t go on this ride. My bike was at a friend’s apartment on the other side of the city from where I was renting a room, and it was getting dark. I started walking to fetch my bike, but turned back due to feeling negative vibes around me. When I came back to the house, one of the other guys renting a room actually offered me to borrow his bike! I couldn’t not go after this. The bike was a little out of tune, clunky, and plegable (a folding bike). The ride that week was long and challenging, going up into the mountains surrounding the city. I left the house late and had to pedal as hard as I could to make it to the ride before they took off. Not long into the ride, I became aware of two people riding on steel touring bikes and speaking English. I gravitated towards these people, since I hadn’t been able to find any touring bicycles like this in Colombia – and I had visited many bikes shops in both Bogota and Medellín, the two largest cities in the country. I wasn’t feeling socially confident enough to initiate conversation, so I just sort of maintained a close distance to these cyclists, unaware that they were accompanied by their WarmShowers host, a Colombian native riding a heavy, rusty hybrid bicycle with a basket in the front. This Colombian guy started talking me, asking if I realized that the ride was going to be difficult, clearly doubting the folding bike’s capabilities of crescing the upcoming steep hills. Caught off-guard, and only really understanding that he was asking about my bicycle, I started explaining that the bicycle was not mine, and I had borrowed it from a friend. He switched to speaking in English, and explained again that the ride was going to be really challenging tonight. I told him again that the bicycle was not mine, so I wasn’t sure how it would perfom on the hills, but we’ll just see when we get there. He introduced himself as Lenin, and I learned that he had recently returned from a totally unplanned bike tour from Medellin to Los Angeles, USA. And he had done it on the bicycle he was currently riding! He was wearing a shirt sponsored by Couchsurfing Medellín that had his name on it and something in Spanish about cycling around the world. I was intrigued and continued to talk with him for the rest of the ride. When we got to the mountainous part of the ride, I just kept pedaling steadily, arriving at the top with plenty of time to wait for the rest of the group, which included over 1000 other cyclists. I actually was the first female to make it up the hill, with the second one being another traveler from Germany who was renting a room in Lenin’s house and had borrowed one of his old, barely functioning bicycles. 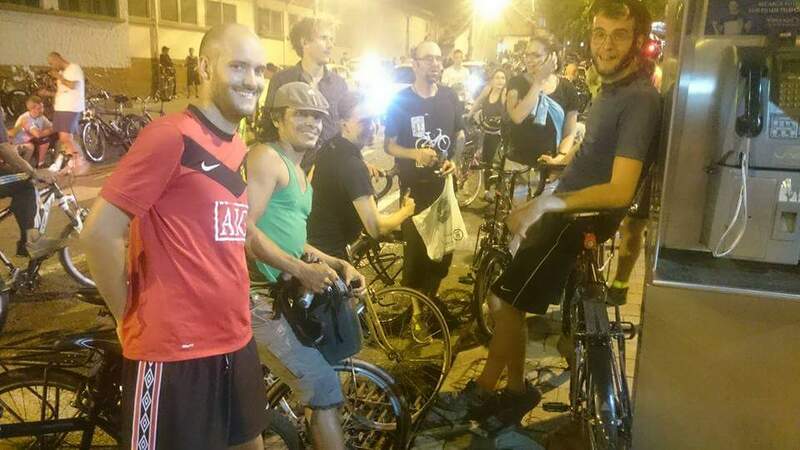 This is the group I ended up riding with during the SiCLeada on the night I met Lenin. At the midway point, Lenin introduced me to the two Germans and Canadian who were all staying at his house. One of the Germans and the Canadian were the guys whose bikes I had been eyeing, and they were in the middle of a grand tour from Canada to Patagonia. Lenin invited me to join the three of them the next morning on a bike ride to Guatape, a touristy town about a 2-hour bus ride from Medellin. It was late already, and I hate not getting enough sleep, so I was reluctant to commit, but I agreed that I would contact him about it the next morning to let him know if I could make it. Unbeknownst to me at the time, the two bike toursists staying with Lenin had expressed dismay that he had invited me, complaining that they would now have to go slow to wait for the girl, and that it would take all day to get there. Despite my sadness from parting with Dallas, I had had more fun that night than I had had in a long time. In the morning, I woke up feeling exhausted, and my bike was still on the other side of town. I didn’t want to ride all the way to Guatape on a borrowed foldable bike. I sent a message to Lenin, telling him that I didn’t think I would be able to make it in time. He assured me that they weren’t ready yet and that I could borrow one of his bikes for the trip. He actually lived relatively close to where my bike was, so I decided to go fetch my bike from my friend’s apartment before meeting the three bike travelers for breakfast. It was at least an hour or two after the time Lenin had told me they were leaving when I arrived at his house, but they were still not ready to go. We all walked across the street to eat breakfast, and then departed for Guatape. The first 20 kilometers out of the city were up a mountain, and I had an advantage on my road bike with just a backpack. The German and Canadian had fully loaded touring bikes with panniers, although greatly dimished because they left half of their belongings at Lenin’s house, they were still much heavier than my rig. Lenin had his heavy, rusty hybrid bike, loaded with tools in the front basket and a backpack strapped onto the rear rack. His rear tire was so worn out, that the center strip of rubber was red, revealing the layer underneath. Contrary to their fears that I would slow them all down, I was able to move much faster, staying ahead of the group for the duration of the ride, pausing to let them catch up every few miles. Upon arriving in Guatape, Lenin helped secure a place to sleep in an athletic complex. One of the ladies who worked there offered to let me sleep at her house, so I left the boys to sleep on the floor with the roaches and spiders and hopped on the back of her motorcycle to go to her house. Guatape is one of the most colorful towns I have visited anywhere in the world, and every house has vibrant bas relief pictures along the bottom edge, depicting something of significance to the family that lives there. This lady’s house had pictures of kayaks, because her daughters were all competitive rowers, two of whom competed in the Olympics. The next morning, after sharing a breakfast with my generous host, I met up with the three guys to ride back to Medellín. Lenin threw a party later that night, which I almost didn’t attend out of exhaustion. However, I realized that this adventure was more than a great distraction from the lost, empty feelings I was experiencing prior to meeting these people. I decided to allow myself to have fun, make new friends, experience new adventures and feel free to enjoy myself. That one bike ride in Medellín, followed by the ride to Guatape and back, laid the foundation for a new partnership between myself and Lenin. We both share a dream to travel the world, and the bicycle has been the perfect mode of transportation for us. It hasn’t been easy for me to let go of Dallas as my partner and best friend, and I still think of him fondly, but now that I am traveling again and have more stories to write, I introduce to you Lenin Cardona as my new partner. We feel both sad and excited to be ending this part of our lives, which we feel lucky to have been able to share together for so many wonderful adventures. I know we both will have more adventures individually, and I am excited to see what the future holds for each of us. Thank you to all of our friends and family who have liked/reacted/commented on Facebook and to everyone in our lives who knew us as a couple and who continues to support us as individuals. We love all of you! Please continue to follow us both on social media. I will be here, as well as on instagram (nomadiccycling) more frequently, and Dallas’s instagram name is neuropolitics.